Why do you need Psychology from a Christian Perspective curriculum for high school? 1) Social Science courses help create the well-rounded transcript colleges seek. 2) Most college majors require Psychology. It is good to have a Christian foundation in psychology particularly before experiencing it at college (perhaps secular) level. 3) It is wonderful to grasp an understanding of God’s wonderful creation of our mind and personality. Vicki Tillman MA (a homeschooling mom and practicing licensed professional counselor), wrote this fun and comprehensive text from a Christian worldview so that students can appreciate God’s handiwork and also be prepared for college settings. This user-friendly Psychology high school curriculum may be completed by a homeschooling high schooler with or without parental support. It is also often used in homeschool group classes. Introduction to Psychology from a Christian Perspective- don’t let your homeschooler graduate without it! You will receive 3 downloads: Introduction to Psychology from a Christian Perspective text, Introduction to Psychology from a Christian Perspective tests, and Introduction to Psychology from a Christian Perspective Answer Key. The text should be given to the student. The tests should be given to the student as he/she completes the appropriate chapter(s). The Answer Key is for the parent. 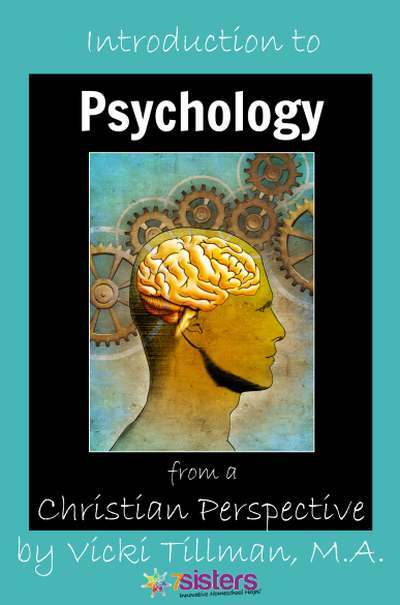 Click here to view an excerpt from Introduction to Psychology. What are homeschooling parents saying about Introduction to Psychology from a Christian Perspective? “Just taking a minute to let you know I have enjoyed using your Intro to Psychology course in our homeschool co-op this past semester. The content was excellent, and the material was laid out in a very user friendly format; both student and teacher editions. The cost was very affordable for the students. I will certainly be returning for additional courses.” – Betty H.
“My daughter and I just finished the Introduction to Psychology from a Christian Perspective curriculum and we enjoyed it very much. Thank you for all that you do in providing curricululm for our students!” – Stephanie B.
Click here for a review by Annie Kate at Tea Time with Annie Kate.